BASSETERRE, St. Kitts, March 28, 2019 (Press Unit in the Office of the Prime Minister) – Prime Minister of St. Kitts and Nevis, Dr. the Honourable Timothy Harris, is expected to update hundreds of Kittitians and Nevisians living in Toronto, Ontario, of the many positive developments taking place in the twin island Federation when he hosts a town hall meeting there this coming Sunday, March 31. Prime Minister Harris will be accompanied by St. Kitts and Nevis’ High Commissioner to Canada, Her Excellency Sherry Tross, and Permanent Secretary in the Office of the Prime Minister, Mr. Andrew Skerritt. The honourable prime minister is expected to comment on the progress of the various capital projects being pursued including the $69 million dollar island main road rehabilitation project and the construction of the second cruise pier, both of which came to fruition as a result of the prudent fiscal management of the country’s resources by the Team Unity administration. The town hall meeting will be held in the Commonwealth Ballroom of the Toronto Don Valley Hotel and Suites on 175 Wynford Drive. The meeting commences at 5pm. 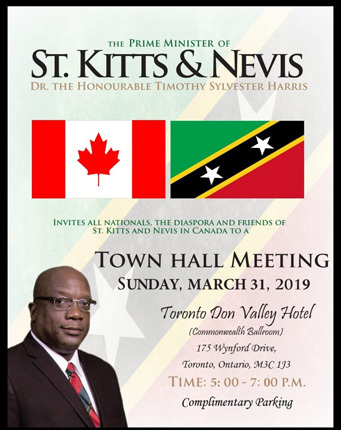 Sunday’s event in Toronto comes in the midst of a series of Community Consultations town hall meetings being held across St. Kitts and Nevis by the Team Unity Government as part of its efforts to promote transparency and good governance.